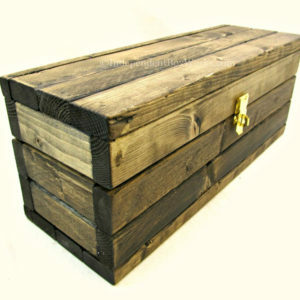 This trading card storage box is a made to order item. Please allow 10-14 days for your item to be completed. If you’re needing it by a specific date, please contact us so that we can ensure your needs will be met. 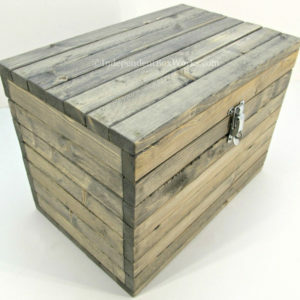 The rustic wooden box is handmade using white pine. The interior lid edges are routed to prevent collision with the edges of the cards. The wood will be sanded and stained with Red Mahogany wood stain and finished with a non marking clear coat. The hardware is your choice and the alternative options can be seen in the listing photos. It has 3 sections, each capable of holding approximately 700 – 800 cards, for a total storage capacity of 2100 – 2400 cards. 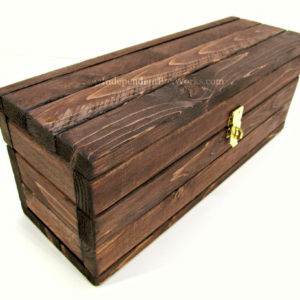 The sections are wide enough to hold standard playing cards and most trading or tabletop game cards. Storage capacity will vary with the card stock thickness or if using protective sleeves for individual cards. Please note that a padlock is not included with this item. We can engrave the lid with a personalized message or logo. When you place your order, there will be a space at checkout to include a Note to Shop. Please use this area to let us know what you would like engraved. The default placement will be centered on the exterior lid, unless otherwise requested. Please see the fourth listing photo for our font options. The interior of the lid also adds about 1.5 inches to the internal height when the box is closed.